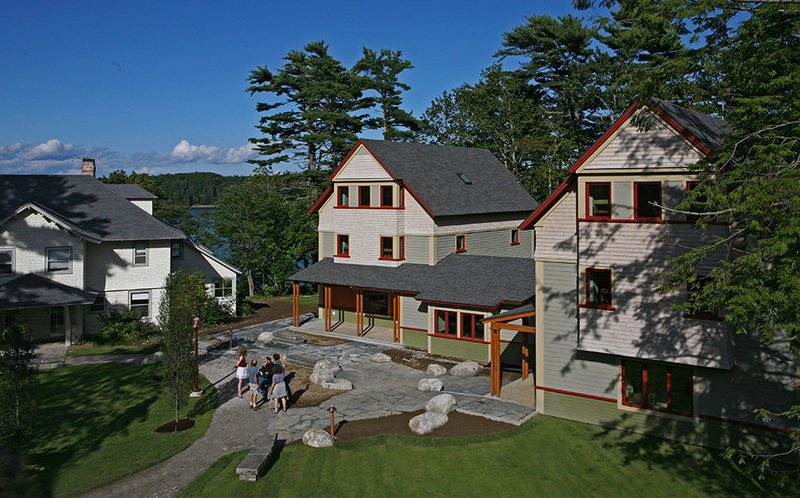 The College of the Atlantic (CoA) in Bar Harbor, ME is a small school with only one major: human ecology. The school’s mission is not only to study our relationship with our environment, but also to improve it. This project developed a new dormitory cluster for the College, high performance housing for students, with the buildings tightly fit into an existing campus with few development spaces. From a systems standpoint, the core driver was the College’s public goal to achieve campus-wide independence from fossil fuel by 2015. 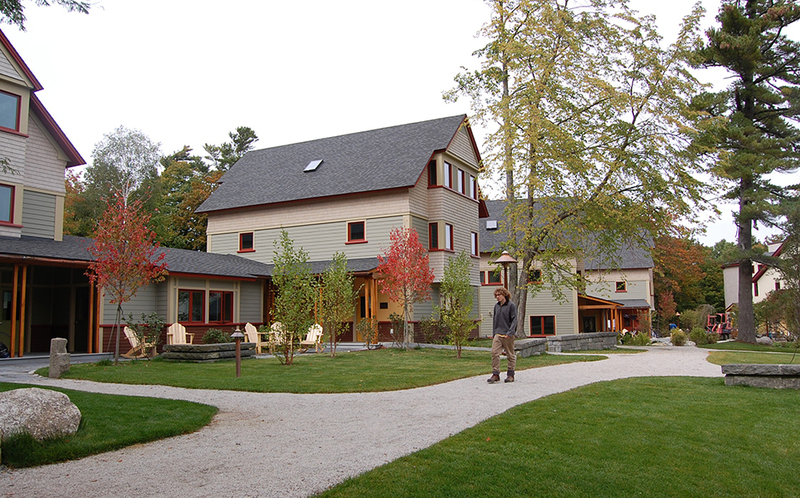 These buildings consume locally-sourced pellet fuel energy, turn their waste into nutrients, and are healthy, invigorating places in which to live. Buildings today are likely to spend the bulk of their lives in a completely different resource climate – one based upon renewable energy. It is expected that these buildings will make a significant contribution to public education in anticipation of that eventuality. A tightly constrained site and a desire for clearly identifiable houses suggested three-story buildings. The prominent shoreline location and the intimate positioning of the buildings argued for diminishing an overly tall impression. The upper level, therefore, is created as an attic story with a steep pitch. Generous roof overhangs increase the solar collection area, as well as providing weather protection to the exterior wall. The simple interior plan and building form allow for manipulation without additional complexity as the house modules are rotated, flipped, and turned to extract maximum potential from each of the six siting situations. The simple module constrains cost and sets up a repetitive visual rhythm. By clustering these duplex buildings together, and weaving them between shoreline and stream bed, adding gardens and common greenspace, the project managed to integrate into the campus plan and unite the distinct pieces at the southern end of the campus into a whole. This is a heating dominant climate, therefore, the predominant strategy was to minimize heat loss. Building enclosures were meticulously constructed, repeatedly tested and verified to achieve a peak load of 8 BTU’s per hour/s.f. with R40+ walls, R45 roof plane, R5 windows, and a remarkable final air-tightness of 0.79 ACH50 consistent over three similar buildings. Without the comprehensive air sealing design (our A5.2 Wall Section Air Sealing Drawing ) and implementation the buildings would have been 7± times leakier. 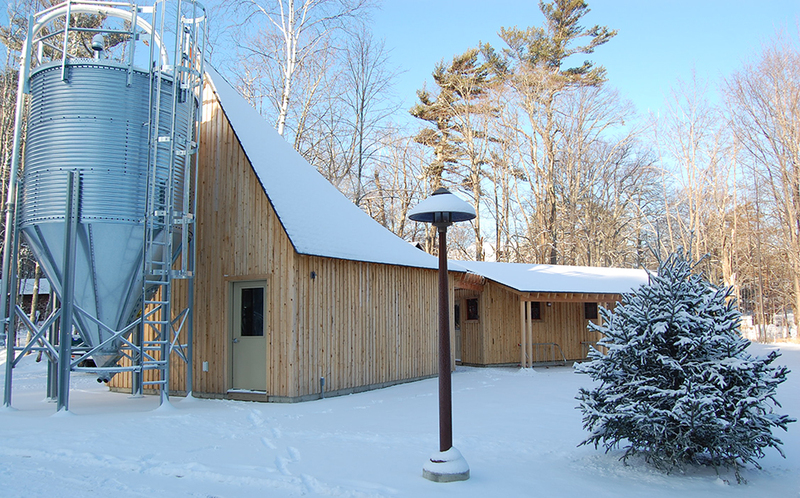 Common space heat is provided by an on-site pellet boiler. 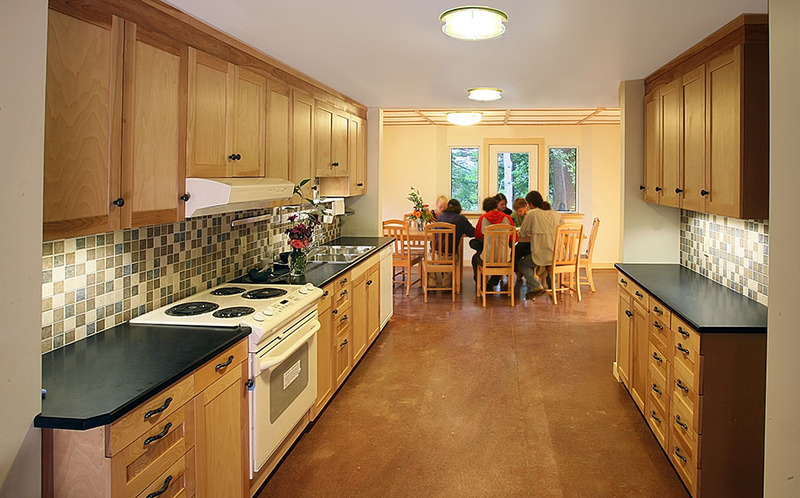 Dramatically reduced heat load allows the ventilation air circulation to provide the heating distribution to the upper two floors, thereby eliminating the considerably more expensive radiant floor initially planned. Simple roof geometries and large applied overhangs protect buildings in this wind-driven rainy environment. 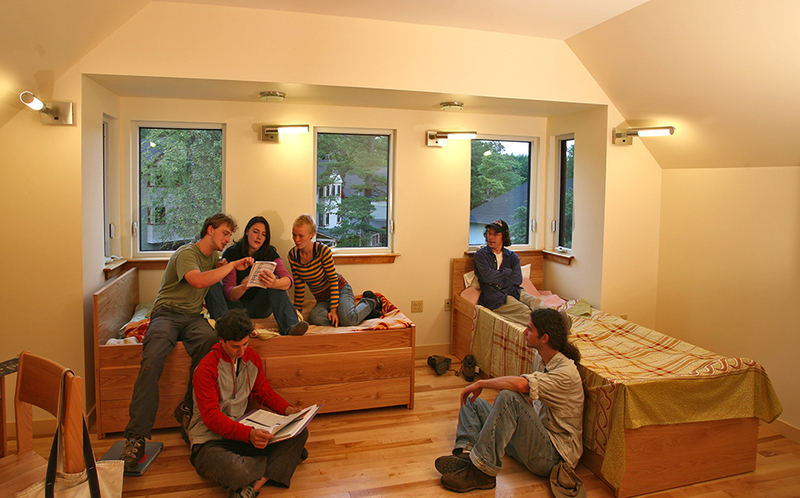 Small rooms benefit from the single-story link, allowing windows on all sides of the upper stories. 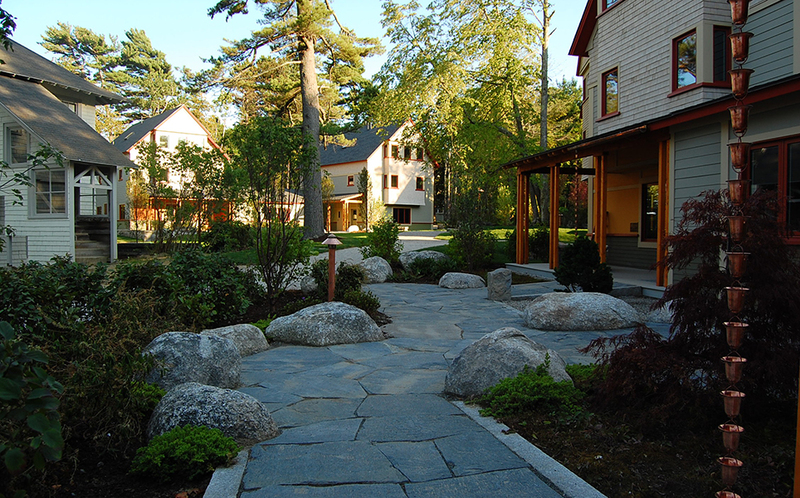 Entry air locks and lack of basements on this rocky Maine site, preserve the thermal envelope, further reducing heat loss. Showers are equipped with drainwater heat recovery that transfers energy to preheat incoming domestic hot water. See the High Performance Buildings Magazine article on this project for more information.